November roared into the Pacific Northwest erasing the warm, sunny afternoons of October. This last week has been incredibly gray and wet! The rain is here.......Even though I am not excited about the long winter ahead, there is something nice about curling up with a good book as you watch the rain pour down outside. In fact, Thursday was very blustery so I opted to stay in and read as part of the Ho Ho Ho Holiday Read a Thon hosted by Kimba@ The Caffeinated Book Reviewer and Jennifer @ Bawdy Book Blog. I am hosting the “Holiday Scramble“. It is a bit tough but fun and you can win a $15.00 card to Amazon ! Try your luck! I am still working on my holiday reads and I will report soon on how I did! Onto other blogging things....November is a month of thanks and I am enjoying reading Felicia@The Geeky Book Bloggers Blog posts on all the book she is thankful for as well as blogs. Check out some of Felicia's best reads and favorite blogs as she continues with her Thirty Days of Thanks! Click on Felicia's Banner to check out her posts! 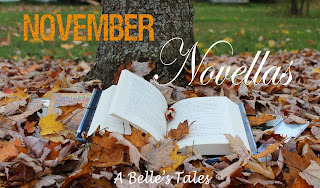 I also am loving my good friend, Michele's month of November Novellas. Michele throughout November is reviewing only novellas. If you are looking for a few quick and sometimes free reads, visit A Belle's Tales for some suggestions! Wednesday: Doctor Sleep by Stephen King: This was such an epic book! Tuesday: Tell Me Something Tuesday: Do you read books based on the season?